Diaper Pail Buying Guide: How to Stop the Stink! Okay, so managing a small human’s waste cycle is not a pretty job, but it is important, and it will become a major daily task, especially for the baby’s first few weeks of life. For full-term babies without health complications, diapering needs will slowly progress over the first five days of life. According to the Mayo Clinic, after the baby’s fifth day of life, parents can expect an average of six or seven wet diapers and at least three soiled diapers. This diaper rate will continue for the next few weeks before slightly tapering off. After about a month, parents should expect an average of four to six wet diapers per day and fewer soiled diapers. In addition to the checking and wiping, parents using disposable diapers will need to decide on a disposal system for dirty diapers. While some parents use their household trash bins for diaper disposal, most find this both inefficient and unsanitary. The sheer number of diapers warrants a dedicated bin, and the nature and … smell… of this waste necessitates a closed storage system. Parents who prefer reusable cloth diapers will also need a bin or a two bin system to manage diaper laundry (see below for cloth diaper storage methods). Pros: Plastic diaper pails are by far the most prevalent options; they are also the least expensive. Most of the best diaper pails on our annual list are plastic, with only a few being metal. These pails are available online and in almost any store that carries baby supplies. Plastic pails options include have the most size and shape variations, and they also tend to have the most features. Cons: Plastic breaks down over time, especially with regular use. Thus, plastic pails may not hold up to the longevity of metal pails, and movable pieces may snap and break off. Further, as plastic degrades, it can begin to take on odors, which is a substantial drawback in the case of diaper disposal. Pros: Metal diaper pails are sturdy and made of odor-resistant steel, so there is little concern for breakage and lingering odors. Due to recent increase in popularity, there is a growing number of metal pail options available. Some metal diaper pails do not require bags or inserts, meaning parents can save money in the long-term by avoiding costly replacements. Cons: Metal pails tend to be both smaller and more expensive than plastic pails. Additionally, metal pails include fewer features like foot pedals, clamps, and locks. Depending on size, diaper pails may hold between fifteen and fifty diapers. Average size pails will typically hold between thirty-five and forty diapers, plus a bunch of dirty baby wipes (we review the best baby wipes here). So, parents will want to consider how often they will need to empty the diaper pail. Keeping in mind newborns will go through more than ten diapers in a day, smaller sized pails will need to be emptied almost daily, while the largest pails will manage a few days before filling up. Families in a two story home will want to consider diaper changing areas for both floors, and may want to have a larger size diaper pail on the most used floor and a smaller one on the other floor to avoid needing to run farther from baby after changes. Diaper pails can range in price from $30 to $100. This expansive range is mostly attributed to the materials used. Plastic pails trend on the lower price range (between $30 and $60) with stainless steel models ranging from $50 and up. Other features that impact pail costs include functional design elements (clamps, foot pedals, twist locks, and other safety considerations) and bundle options to include liners and inserts. A substantial portion of current market diaper pails use proprietary liners. Liners are typically ring inserts, which allow diapers to be fed into a tube-shaped bag. Pros: Diaper pail liners are common tools, easily found online and in baby supply stores. Pail liners are typically made of multiple-layer plastic to trap in odors and avoid leaks and rips. Some liners are even scented to add additional pleasantness to diapering. Diaper rings allow continuous refills to reduce waste and handling. Because of their popularity, a number of generic brands have created nearly-universal diaper liners for use in various pail models. This can help parents save some money. Cons: Using diaper pails with liners means constant liner purchases. This can create a substantial expense for parents. Additionally, some liner brands (or generic options) are very thin and tear easily, creating additional cost for replacements as well as a foul mess. Some diaper pails, like the top-rated Ubbi Steel Diaper Pail, let you "BYOB" (bring your own bag), so that can save you quite a bit of money and energy by simply using your own kitchen garbage bags. In addition to considerations for metal versus plastic diaper pail design, parents will also want to be aware of some optional features that may help narrow down disposal system prospects. These features will help with overall function, sanitation, and safety. Diaper pails with an internal clamp system are popular for both their odor control and their secure hold during emptying. The internal clamps will pinch down on a liner insert. When a diaper is inserted, the clamps will release either by downward force or through a mechanical connection to a release pedal. The clamps will then return to a closed position to eliminate additional odor escape. When the diaper pail is ready to be emptied, the clamps offer additional tension on the liner insert to help avoid rips and spills. The downsides to a clamp system include hassle and damage. Some parents find it difficult to force the diapers through a manual clamp feed. Alternatively, pedal release clamps can become damaged and stop working. Foot pedals are a wonderful function for both sanitation and ease of use. Parents will enjoy the freedom to avoid touching the diaper pail and struggling with covers. The foot pedal will trigger the diaper pail lid to lift-up with hands-free ease. Additionally, for those diaper pails with internal clamp systems, the pedal will release the clamps for diaper insertion. The disadvantage to a foot pedal design is the potential for breakage, and this is especially troublesome for plastic models - though many of our best diaper pails have some impressively sturdy foot pedals. 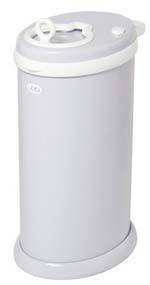 Odor filters are included with some diaper pail models. These may include odor blocking discs, inserts, and built-in antimicrobial to help prevent bacteria growth on the diaper pail. For those pails that do not include odor filters, there are filter insert options available from various baby product manufacturers. New parents may not yet be concerned with baby exploring and getting into everything, but eventually, this will be something to consider. Child safety locks are especially important for cloth diapering families using the wet or combination methods (more information on cloth diapering below). Some safety lock designs include a combination foot pedal/ snapping lid or two handed models with a turning latch. Parents who use cloth diapers will also need a storage system for diaper laundry. For health and wellness reasons, wet and soiled cloth diapers should be stored separately from other laundry. Cloth diapering is an undeniable lifestyle choice, and cloth diapers have come a long way from the old flats and prefolds with the big safety pin at the sides. We review the best cloth diapers here, and the best disposable diapers here. In addition to diaper changes, parents will need to establish a solid plan for regular diaper storage and washing. Pro tip: While parents may consider using standard garbage pails for cloth diaper storage, actual diaper pails are more effective at locking in odors and preventing unintentional tips and spills. Both plastic and metal diaper pail models are effective for cloth diaper storage. Set up ONE diaper pail. Some parents may elect against lining this pail to save money. However, without liners, the diaper pail will need frequent washing and sanitizing to avoid creating health hazards. It is recommended that parents include a liner in their dry cloth diaper pail. Standard diaper pail liners are effective for this purpose. Deodorize. Storing soiled diapers until washing creates a powerful odor. Parents can do themselves a favor and be proactive in maintaining odors by sprinkling some baking soda in the bottom of the diaper pail liner. Parents can continue adding a sprinkle of baking soda on top of each diaper as the pail as filled. Alternatively, layering fabric softener sheets between diapers can also help reduce odors, and the sheets are perfectly fine to wash with the diapers. There are some reusable deodorant insert options as well, but parents will need to make sure these are not accidentally washed with the laundry. Remove Solid Waste. Soiled diapers will require special attention. Breastfed and formula fed infants typically produce output that is water soluble and may be difficult to remove from the diapers. If there is a substantial amount of runny liquid, parents will want to pour that into the toilet before placing the diaper in the pail. Once babies begin consuming solid food, their output will become more solid. This should definitely be removed before placing the diaper in the pail. Removing solids helps avoid additional ammonia odors and bacterial growth. Separate Diaper Layers. Some cloth diapers include multiple layers of cloth and waterproof material. To ensure diapers are fully cleaned, these layers will need to be separated before laundering. So, parents can do themselves a favor and separate these layers before placing the diaper into the pail. Launder. Maintaining a regular laundering cycle is imperative to support sanitary living conditions and to ensure baby always has a clean diaper at the ready. Dry pails should be emptied and washed every 48 hours to avoid hazardous bacterial build up. On laundry day, parents should first run the diapers through a cold rinse and then launder as usual. Set up ONE diaper pail. Strong, reinforced wet pail liners are available to fit many diaper pail models. When setting up the wet pail, parents will insert a tight-fit liner and fill about half to three-quarters full of cold water. Deodorize. The wet pail method helps control bacterial growth and subsequent odors. However, parents can take the extra step to add a deodorizing element right into the water. Baking soda, essential oils, or vinegar are all great options for wet pail deodorizers. Remove Solid Waste. This is an important step for wet pails. In addition to simply dumping any solid waste into the toilet, parents should give each diaper a quick mini shower swish or dunk to remove as much soiling as possible. Separate Diaper Layers. As with the dry pail method, diaper layers should be separated before submerging them into the wet pail. This will ensure diapers are thoroughly cleaned. Launder. Laundering wet pail diapers has its own unique advantages and disadvantages. One huge perk is less frequent laundering since the water in the pail serves as a presoak for the diapers. Parents can simply wait until the diaper pail is full (or until they are running low on clean diapers) to run the wash. Wet diaper pails also offer a limited amount of hands-on effort required. For parents with a top-load washing machine, the entire contents of a well maintained wet diaper pail can simply be poured into the washer. The downsides to laundering with the wet pail method include the sheer weight of a full pail. Lifting a full pail (without spilling!) and carefully pouring into the washing machine may be a two person job. Further, parents with front load washers may find it seriously difficult (if not impossible) to fully dump the pail contents into the washer. This could create additional mess and cleanup. Because the diapers have already pre-soaked in the wet pail, a preliminary rinse cycle is not necessary. Instead, parents should quickly run a spin cycle to drain excess liquid from the wet pail. After the spin cycle, diapers should be washed in a hot water cycle. Wash Diaper Pail. Between diaper loads, parents should wash out the wet pail with hot water and a cleaning solution. Pro-tip: To further facilitate wet pail laundering, parents will want to look for units with fully removable lids. These models typically have side clamps as a lid locking device. Combination Dry & Wet Pail Method: For parents looking to glean the perks of both a wet and dry pail method, there are two options for a combination diaper pail system. Combination (wet / dry) diaper pail methods are accomplished through a one-pail or two-pail system. One-Pail Combination Diaper Laundering: The single pail method includes the rinsing of a wet pail but without the standing water. Parents using this method will move solid waste from diapers, seperate layers, and then dunk and rinse the diapers in a mini shower before placing them into a dry pail. There will be some moisture in the pail, so parents will need to stick to a strict laundering schedule to hinder bacterial growth and the potential for mildew build up. Dry pail deodorizing methods can be used to keep foul smells to a minimum. Advantages: The perks of the one-pail combination method include increased stain and odor control. Also, parents who are concerned for the standing water hazard may find more comfort in this method over a wet pail system. Disadvantages: On laundry day, the pail will be heavier than a typical dry pail due to the added wetness. Parents who do not enjoy the additional hands-on washing and rinsing will probably dislike this method. Two-Pail Combination Diaper Laundering: For a two-pail combination, parents will separate wet diapers from soiled diapers. When baby simply wets a diaper, parents will separate diaper layers and place it into a dry pail. Soiled diapers will be dumped, rinsed, and submerged into a wet pail. Parents should follow safety and sanitation considerations for dry versus wet pail maintenance. On laundry day, the pails can be combined by dumping in the wet pail, running a spin cycle, and then adding the dry pail diapers for a rinse and laundering cycle. Advantages: In addition to having all of the perks of both the wet and dry diaper pail methods,having two diaper pails lightens the load for lifting diapers into the washing machine. Families with more than one child in diapers will also appreciate the extra storage space to maintain a less stressful laundry cycle. Disadvantages: This combination method also includes all of the drawbacks associated with dry and wet pail methods. Plus, there is the initial purchase drawback as parents will need to double their diaper pail purchase. Families with smaller space may find further drawback in adding an extra pail.